Those people who think that Shutter Shades are not in use nowadays are wrongly informed. In a very recent video of a famous person, he is seen wearing a pair of Shutter Shades. What can you say about that? After a few days of this event, Paris Hilton, a key figure in the Hollywood fashion industry was seen wearing shutter shades as well. After these two major events, the fashion of shutter shades started just like it started in mid 80’s. After mid 80’s, these sunglasses were not used for 15 years and after that these two events as told earlier took place and caused the manufacturers to start the production of these shutter shades on large scale. Now, you can buy them wholesale or retail. Can these wholesale shutter sunglasses suit every person? This is a question that is asked by most of the people related to the fashion industry. Basically these shutter sunglasses are very large framed glasses and do not suit every person. These wholesale sun glasses look good on those people whose facial muscles are very strong. People having big faces can also wear these cool shades. 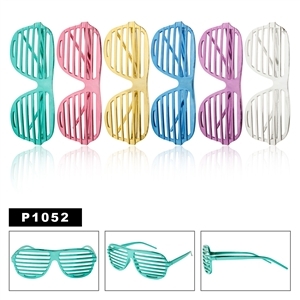 There are many different colors that are available in these sunglasses and can be bought depending on your choice. However, white colored are in real demand these days. The prices of these glasses vary depending who you buy them from. Many sunglass wholesale companies are offering these for around $25 a dozen or even less. 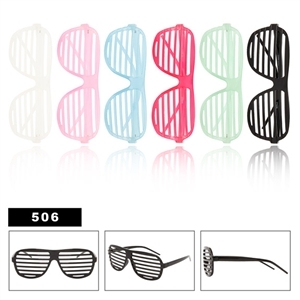 After looking at these popular shutter glasses be sure to look at the sponged cushion wholesale sunglasses we carry. These are popular for motorcycle riders considered biker sunglasses.